Background: Given the frequent presence of multiple comorbidities, obese patients undergoing laparoscopic gastric bypass are at risk for perioperative complications. We hypothesized that patients with gastroesophageal reflux disease (GERD), obstructive sleep apnea (OSA), and asthma would have higher rates of pneumonia. Methods: We retrospectively analyzed 343 laparoscopic gastric bypass patients, operated on at a single institution between July 2005 and January 2007. We evaluated patient demographic data and presence of comorbidies, including GERD, OSA, asthma, diabetes (DM), hypertension (HTN), and dyslipidemia (Dyslipids). 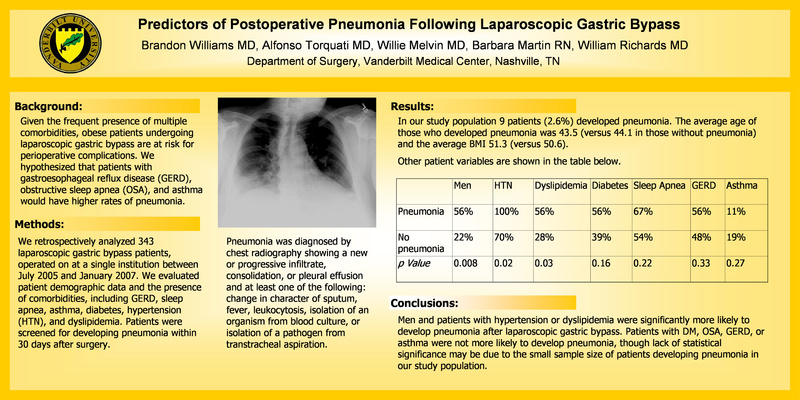 Patients were screened for developing pneumonia within 30 days after surgery. Pneumonia was diagnosed by chest radiography showing a new or progressive infiltrate, consolidation, or pleural effusion and at least one of the following: change in character of sputum, fever, leukocytosis, isolation of an organism from blood culture, or isolation of a pathogen from a transtracheal aspiration specimen. Statistical analysis was performed with a T-test. Results: In our patient population 9 patients (2.6%) developed pneumonia. The average age of those who developed pneumonia was 43.5 (versus 44.1 in those without pneumonia) and the average BMI 51.3 (vs 50.6). In patients that developed pneumonia the prevalence of DM was 56% (vs 39%), OSA in 67% (vs 54%), GERD in 56% (vs 48%), and asthma in 11% (vs 19%). Conclusions: Men and patients with hypertension or dyslipidemia were significantly more likely to develop pneumonia after laparoscopic gastric bypass. Patients with DM, OSA, GERD, or asthma were not more likely to develop pneumonia, though lack of statistical significance may be due to the small sample size of patients developing pneumonia.